White Mountain National Forest is located in New Hampshire, although almost 6% is located in neighboring Maine. It was established in 1918 as a result of the Weeks Act of 1911. Its area consists of three discontinuous areas, and there are six designated federal wilderness areas within the forest. One hundred miles of the Appalachian Trail run through the park’s grounds, and due to its proximity to major metropolitan areas, it is one of the most-visited outdoor recreation sites east of the Mississippi River. 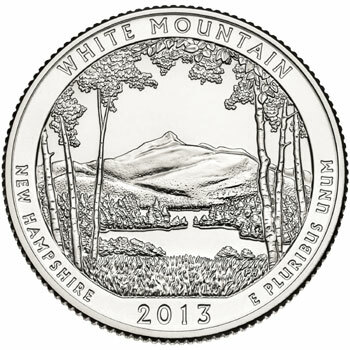 The White Mountain National Forest Quarter features the image of a lake, with Mt. Chocorua in the background, framed by a grouping of birch trees. Also included in the design are the incused phrases “White Mountain”, “New Hampshire”, and “E Pluribus Unum”, as well as the date of issue. The coin will represent the first issue of the United States Mint’s America the Beautiful Quarters Program for 2013. The United States Mint and U.S. Forest Service will hold an official launch ceremony for the coin on February 21, 2013 at 10:30 AM at Plymouth State University, Silver Center for the Arts, Hanaway Theatre, 17 High Street, Plymouth, NH. The ceremony will be attended by Richard Peterson, Acting Director of the United States Mint; Maggie Hassan, Governor of New Hampshire; representatives from the offices of U.S. Senators Kelly Ayotte and Jeanne Shaheen, and officials from White Mountain National Forest. The ceremony is open to the public and will also be attended by hundreds of local area school aged children. Following the ceremony, attendees will have the opportunity to exchange currency for $10 rolls of the new White Mountain National Forest Quarters at face value. Finally, the quarters will be distributed to the channels of circulation.